In Chengdu, the women's world team championship has ended. In the central match of the ninth round, Georgia defeated China 2.5-1.5 and ensured themselves the gold medals. Meri Arabidze beat Shen Yang and the other three games were drawn. The Georgian team's result can be regarded as a surprise. The last big successes for their team were in 2008-2009: in 2008, they won gold at the Olympiad, and a year later, at the European Championship, they lost out to Russia only on tie-break. Since then, their team has not been in contention for first place and many have not even regarded them as serious contenders for top spot in team events. The training staff recently changed: Elizbar Ubilava is head, assisted by David Jojua. Borjomi. Training camp before the event. Kirsan Ilyumzhinov only came to the top team to be photographed. He still made the first move in the Russia match. We do not yet have today's games, as they were not broadcasted live. But you can see how the team approached the top spot in the first eight rounds. A few minutes ago in Chengdu, the eighth and penultimate round of the womens' world team championship ended. Two teams are fighting for victory in the event - Russia and Georgia. Today the Georgians defeated Armenia 3-1, whilst Russia overcame Ukraine 2.5-1.5. The latter key match was clinched by Natalia Pogonina and Olga Girya, who won on boards three and four. The Muzychuk sisters tried to save their team, but only Anna managed to score the full point. Some of today's matches in the women's world team championship ended in draws: India - China, Poland - USA, Russia - Armenia. The failure of the Russians to win can be regarded as the biggest surprise. Girya beat Gaboian on board four, and there were draws between Mrktchian - Pogonina and Goryachkina - Galoian, but Valentina Gunina lost, just as she did yesterday. 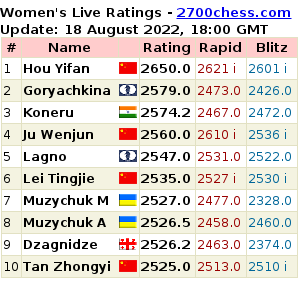 A few minutes ago in Chengdu, the seventh round of the women's world team championship ended. The leaders Georgia beat India 2.5-1.5, whilst Russia drew with Kazakhstan. It must be admitted that the results could have been worse for both, especially Russia: Gulmira Dauletova was unable to convert to a full point a completely winning position against Alexandra Goryachkina. The Russian women's team has beaten China again. 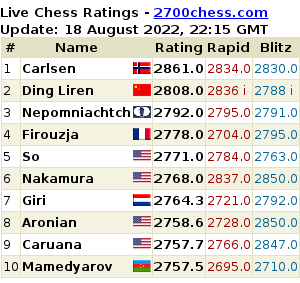 They did so at the Tromso Olympiad, thanks to Ekaterina Lahno's victory over Hou Yifan, and now, in the world team championship, the girls easily coped without their leader, even two leaders, since Valentina Gunina did not play. The rivalry between Russia and China continues. It is not ten days since the end of the traditional annual training match between the men and women of the two countries, and now the two teams are again battling each other. But this time with different teams and a very unusual format.